If you’re an experienced screenwriter there’s probably better ways for you to sell a script than submitting to postings on Craig’s List but if you’re trying to make your own breaks and get your scripts produced this is probably a pretty good place to start looking for producers to turn your script into a movie. Craig’s List has two sections (in every city) where you can often find “job” posts by directors and producers looking for screenplays. You can find them under the “writing/editing jobs” section and the “writing gigs” section. I typically look in both sections for Los Angeles and New York. I imported the RSS feeds into my MS Outlook RSS section so the new job posts come in like an email into the respective folder and I can quickly look at them. You’ll find the RSS link at the bottom of each page. This makes it very easy to quickly keep an eye on virtually every post that goes through the system. Most are not for screenplays but some are. And looking at them in Outlook using the RSS feed probably takes me less than 10 minutes per day to look at every single ad in all 4 sections. On average I would say I see 2-5 posts per week that I respond to. I’ve heard a wide array of opinions about whether these posts are worth responding to. Many writers think they’re complete junk, and for the most part they’re right. However, I personally see very little downside to responding to them. 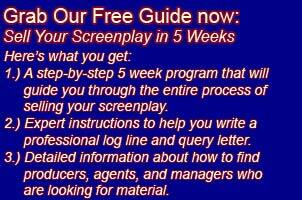 I never send a complete script (no production company would want you to). I send a 1 page query letter with usually 1 or 2 synopses (also usually about a page each). I have all my query letters saved in one file so it’s very easy to copy and paste the appropriate letter into an email – it takes me less than 5 minutes to respond to one of these posts. But if you do decide to submit to these sorts of posts always use common sense and caution. Make sure you have a copy write on your work. If the post is poorly written and doesn’t seem legitimate it probably isn’t. If someone responds to your query and they sound like a jackass they probably are. When you’re looking in the gigs section, the people who have posted the ads have done so for free. So there is literally no barrier to posting an ad in the gigs section and the quality of the posts reflects this. In all the major cities like Los Angeles and New York in order to post in the “writing/editing jobs” section a poster has to pay $25. While this isn’t a lot of money, it does seem to weed out most complete wanna-bes because the total losers simply post in the gigs section and are too cheap to spend the $25. So keep that in mind if you decide to respond to these posts and take the ones in the writing/editing jobs section a little more seriously than the ones in the gigs section. One thing that definitely does happen is people who are trying to sell services to screenwriters will post a seemingly legitimate ad calling for screenplays and then add you to their mailing list and try and sell you all sorts of screenwriting services. I’ve never signed up for a single email list about screenwriting but I get several emails per day for various screenwriting services. I’m guessing most if not all got my email address by posting a fake ad. While this is annoying it’s certainly not the end of the world and I use Gmail which has a good spam filter so it’s not hard to get rid of their emails pretty quickly. One thing I don’t understand is why other screenwriters get so annoyed at some of the obvious scams and wanna-bes. If someone posts an ad that’s clearly not legitimate why bother flagging it? If some newbie screenwriter is dumb enough to waste his time responding to it the better for me. In addition it often times seems like some legitimate posts are flagged (and removed) in an effort to prevent other screenwriters from submitting – that really is annoying. I recently optioned my screenplay Irrefutable Evidence to a young producer who I found through Craig’s List. So there are people out there who are legitimately looking for scripts to produce. Just don’t expect any big time producers or any major production companies to be looking for scripts on Craig’s List, because they won’t be. What has your experience been submitting your scripts to Craig’s List? Leave a comment below. I’d be interested in hearing other people’s thoughts.